French journalist; born at Havre 1846. When still a youth he went to Paris and bought and edited the "Revue de Paris," which, however, was soon discontinued. For nearly twenty years he reported for "Le Gaulois" and "Paris Journal," becoming, in 1868, part owner of the former, which he made the organ of the Bonapartists. When Prince Louis died in 1879 Meyer left the "Gaulois" and bought the "Paris Journal," soon afterward "Le Gaulois," and finally the "Clairon." The three papers he then merged under the name of the "Gaulois," and made it the main organ of the Clerical-Monarchic party. 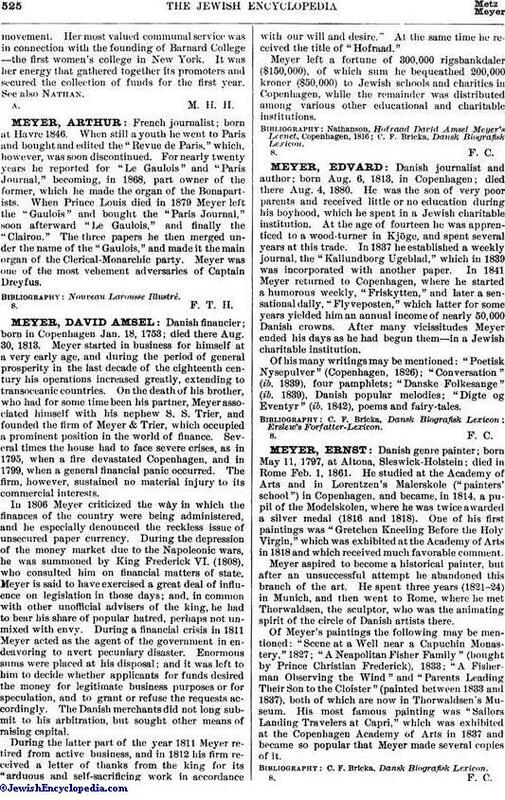 Meyer was one of the most vehement adversaries of Captain Dreyfus.